Tank Brand ® is a registered trademark with the United States Patent and Trademark Office. Tank Brand QUALITY CONSISTS OF A TOP OF THE LINE PLASTIC HOUSING AND HIGH GRADE CELLS. The Tank Brand SR20-T headset is a lightweight single cup headset that rests on one ear and is designed for use in normal noise environments. Comfortable - weighs just 6 ozs. We use a screw connector to attached to the device. Stays attached securely. 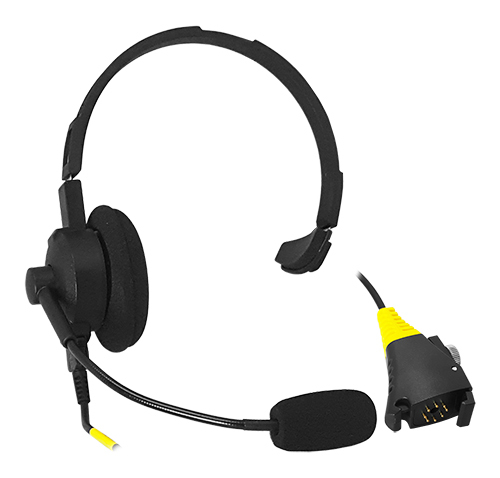 We use an HRS connector from the headset to the device, This is so, if any part of the cable becomes broken or damaged - it can be replaced easily. just order replacement cable - no need to send in for lengthy repair, or replacement..
Padded, waterproof ear cup adjusts vertically and horizontally to fit snugly and comfortably.